Spring has sprung! 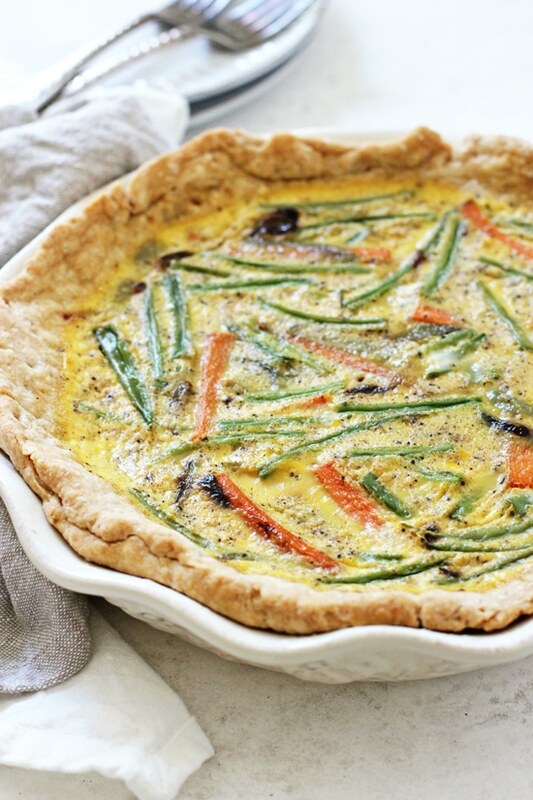 So today we celebrate the change of seasons with this veggie packed dairy free quiche! And while it may be raining / sleeting as I’m sitting down to write this (come on now April! ), we can at least pretend that warmer weather has arrived with our choice in food. Which brings us to today’s recipe. 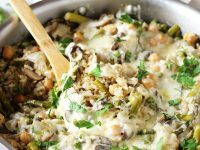 With a creamy, dreamy filling made with eggs, almond milk and colorful spring vegetables + a tender, buttery crust (made without the butter! ), this quiche does not disappoint. 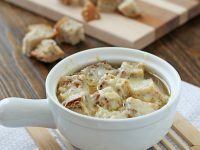 It’s fantastic warm straight out of the oven, absolutely delightful served at room temperature AND keeps well for several days in the fridge. 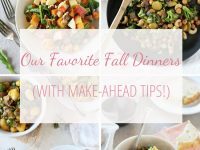 Not to mention that it pairs with just about anything – a big ol’ salad, all kinds of fruit, roasted potatoes, coffee galore! You get the picture. And with brunch season upon us, this quiche is ready to shine. 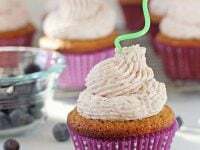 At potlucks, Easter, bridal showers, Mother’s Day! It’s ready for you on all fronts. So, let’s first chat a bit about the pie crust we’re using in today’s recipe. 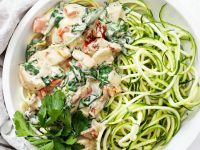 It’s made solely with pantry staples, like flour, coconut oil, cold water and salt, and is really simple to pull together. 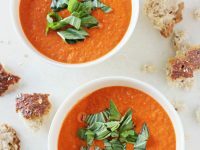 All you need is a large bowl, a whisk and a pastry cutter. Now. 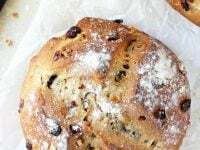 While the dough itself is crazy easy to make and work with, there are a few tips and steps to ensure that it bakes up correctly in the oven. So. After we make the dough, we roll it out immediately and transfer to a pie plate. We tuck it into the plate, making sure it’s nice and smooth. At this point, you want to make sure that the sides of the crust are nice and sturdy – so use any excess dough to bulk them up as needed. It’s totally fine if it doesn’t look perfect – it’s much more important to have sturdy / thick sides for the final product. NOW. The really important part – the pie shell then gets transferred to the refrigerator to chill for 30 minutes before baking. This really really helps to prevent the sides of the crust from shrinking down and bunching up in the oven – so please do not skip this part!! And finally, we blind bake the crust (i.e. bake it for a bit before adding in the filling). The chilled pie shell gets lined with parchment paper, filled with pie weights or dry beans and is then baked off for 10 minutes. And do not be tempted to skip the weights! This is essential for preventing the bottom of the crust from bubbling up and also helps keep the sides from shrinking down. Alright, now that we’ve covered the crust, let’s chat about the filling. 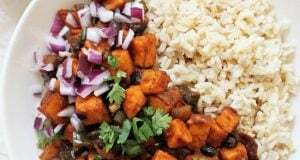 Which is made with sautéed red onion, carrots and green beans, along with a few spices to really pump up the flavor. But, the most important part is the ratio of eggs to almond milk. 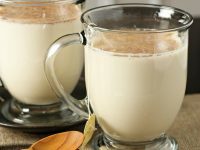 After trying many different methods, this is what I’ve found works best – crack four large eggs into a 2-cup liquid measuring cup and then fill with almond milk until it reaches 2 cups of total liquid. This ratio results in a perfectly creamy filling that is so delightful you won’t even miss the cheese. The pie plate that I use for this recipe measures 10 inches across and is just over 2 inches high at the tallest point. I’d suggest using something similar in size for best fit. I purchased mine from Sur La Table many years ago (I can’t find it anymore) but this pie plate from Williams and Sonoma is really similar. <— Not sponsored! Just a suggestion! Keep in mind that since we are using coconut oil the crust won’t get as deep golden brown in color as a traditional butter crust. But, this is also kind of nice since you don’t need to worry about the edges burning / using a pie shield. While I prefer to use french green beans in this quiche (i.e. the skinny ones) as they look a bit nicer in the final product, you can of course use regular green beans instead. 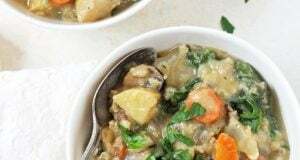 And finally, remember that the veggies won’t really cook any further in the oven – so be sure that they are tender to your liking after cooking in the skillet. So if you need to add a few extra minutes to the skillet cook time to get them nice and tender, then by all means do so! Let the quiche cool completely, then cover tightly in the pie plate or slice / transfer to an airtight container. It will keep like this stored in the refrigerator for up to four days. You can also freeze the fully baked (and cooled!) quiche for a later time. When ready to enjoy, let the quiche thaw in the refrigerator then rewarm in the oven. 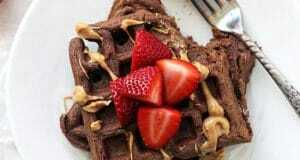 Additional Dairy Free Brunch Recipes You Might Enjoy! 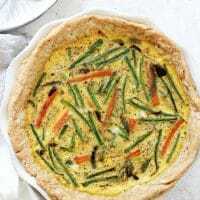 Veggie packed dairy free quiche! Made with a coconut oil pie crust, eggs, almond milk and lots of colorful veggies! It’s a lighter take on the classic brunch dish! Perfect for potlucks, mother’s day and easter! 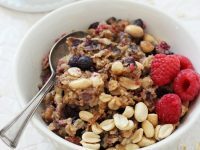 In a large bowl, whisk together the all-purpose flour, white whole wheat flour and salt. 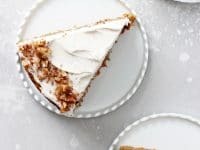 Add in the coconut oil and use a pastry cutter to cut the oil into the flour, continuing until it resembles even-sized crumbs and there are no large chunks of coconut oil visible. Add in the ⅓ cup water and use a wooden spoon to stir until the dough starts to come together. Add in additional water, 1 tablespoon at a time, as needed to really bring the dough together (I usually need to add about 3 extra tablespoons). Use your hands to form the dough into a mostly smooth ball. Transfer the ball to a floured work surface, then flatten into a smooth disc with your hands. Sprinkle the top lightly with additional flour then roll the dough out until you have a circle that is about 12 inches in diameter. Carefully transfer the dough to a 10-inch pie plate, then use your fingers to tuck the dough into the plate, making sure it is nice and smooth and that the sides are nice and sturdy (using any excess dough to bulk them up as needed). Prick the bottom of the crust a few times with a fork, then transfer to the refrigerator to chill for 30 minutes. 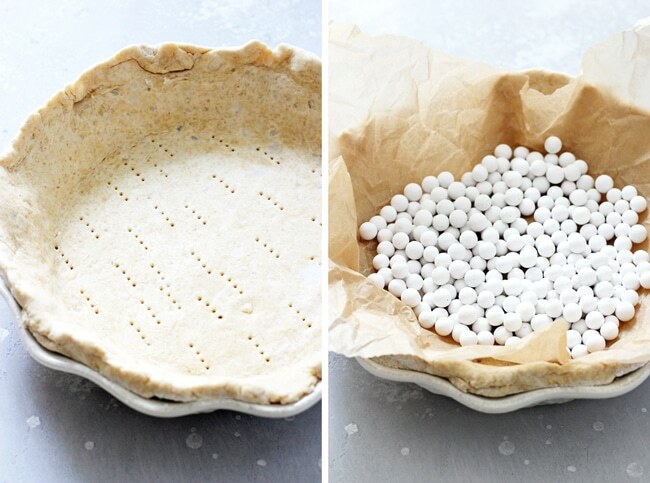 Gently line the chilled pie crust with parchment paper, then fill with pie weights (or dry beans). Bake for 10 minutes. Remove from the oven, carefully remove the parchment / pie weights, then set aside to cool slightly while you make the filling. Add the olive oil to a medium-large skillet set over medium heat. When hot, add in the onion and cook for about 2 minutes, until it starts to soften. Add in the carrots and green beans and continue to cook for about 5 to 7 minutes, or until the veggies are tender to your liking. Remove from the heat. 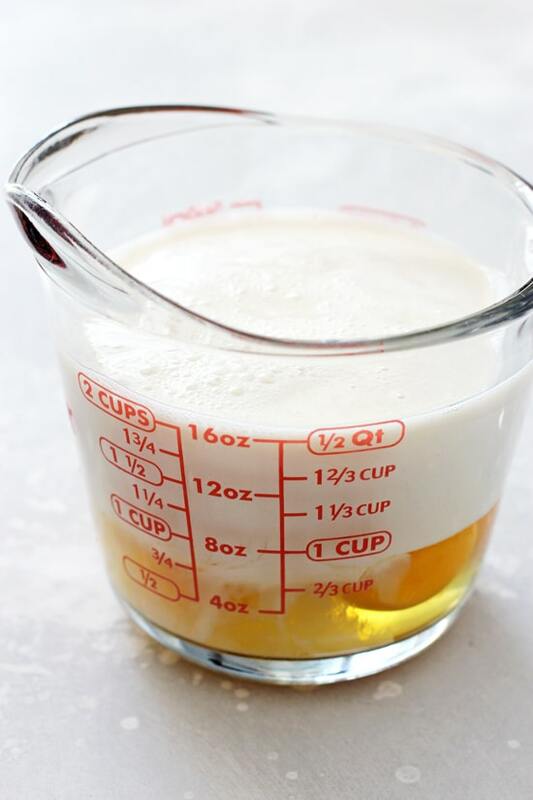 Crack your eggs into a 2-cup liquid measuring cup, then add in almond milk until you have 2 cups total liquid (this is approximately 1 cup of milk). Transfer the mixture to a medium bowl, then add in the salt, pepper, garlic powder, nutmeg, cornstarch and worcestershire. Whisk until well combined and everything is blended / smooth. Evenly distribute the cooked veggies in the pie crust, then pour the egg mixture over the top. Bake for about 45 to 50 minutes, until the filling is set and is slightly puffed in the middle (if you insert a toothpick into the middle it should come out clean). Let the quiche cool for at least 15 minutes (ideally more!) before slicing and serving. 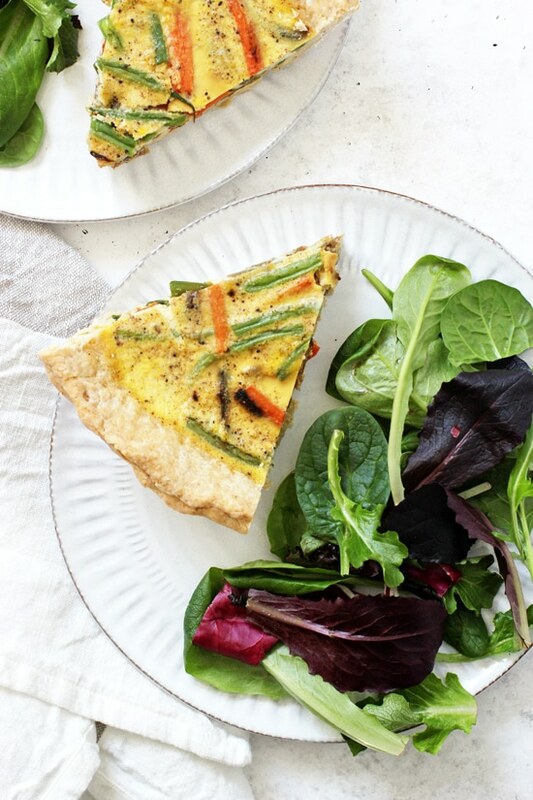 *You want approximately 2 ½ cups of veggies for this quiche. The quantities listed for the red onion, carrot and green beans will give you right around this amount but adjust as needed. **If you don’t need to keep this quiche vegetarian, you can absolutely use regular worcestershire sauce instead. 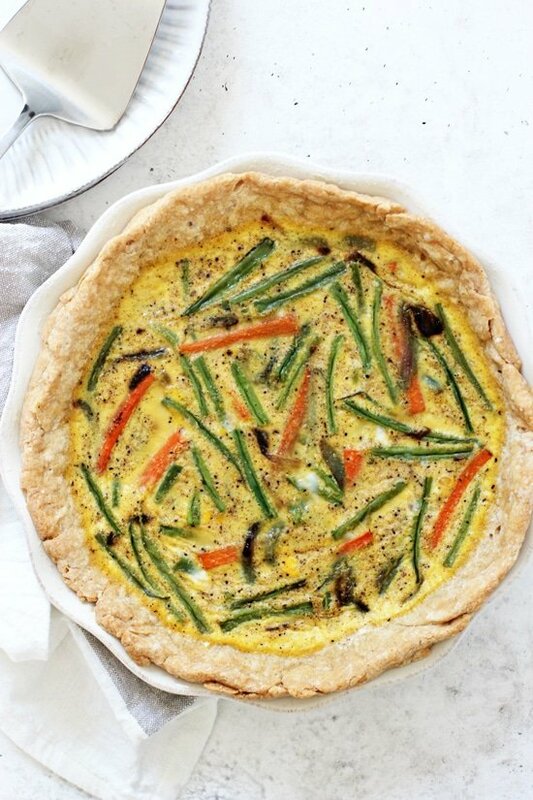 Making quiche dairy free is no simple task, and this looks delicious Ashley! Love all the veggies, and I wouldn’t miss the cheese! 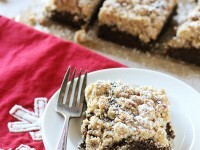 I can imagine devouring this with a big plate of crunchy salad, double yum! Look at you getting all creative making a quiche without cheese! This is funny because I JUST made a quiche a few days ago for the first time in awhile. I’m okay with cheese but don’t usually eat eggs, so I was actually wondering about quiche recipes sans the eggs. Will have to look! This would make a perfect addition to the Easter lunch buffet! That crust turned out really perfect.